The My 80s radio show recently celebrated its first anniversary at Mad Wasp Radio, and I have written a book to mark the occasion. Detailing all the tracks played on the show during that year, as well as Favourite Five, Word Up, Back On Track and Our Choon features, My 80s Fun & Facts includes crosswords, puzzles and word searches relating to the music and artists who have appeared on the show. There is even a ‘hidden’ online Monster Mash Up, accessible via a QR code in the book, and a pop quiz compiled by our quiz meister extraordinaire, Alan Read. 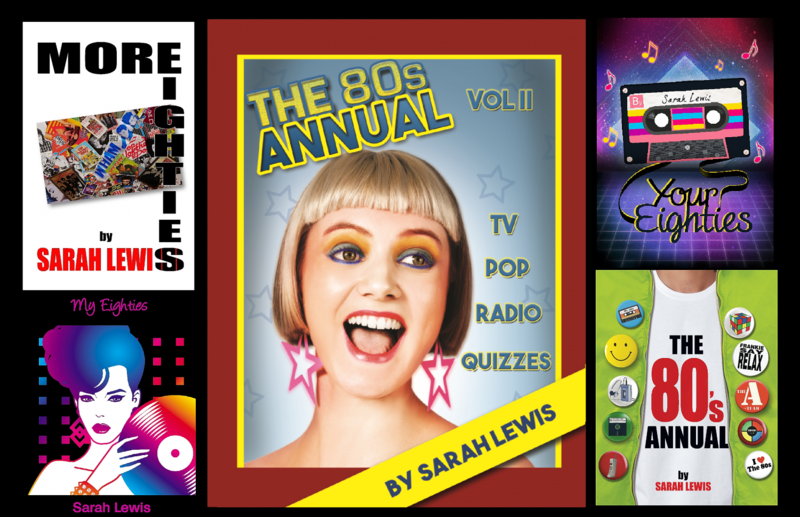 Published this Thursday (27th September) by Red Rain, My 80s Fun & Facts is available from most online book stores, including The Book Depository , Blackwell’s and Amazon*. *Delivery is approximately 3 working days, NOT the 1 to 2 months currently stated on Amazon. On the next My 80s Radio Show my special guest will be Chris Amoo, lead singer of The Real Thing. The band that brought us hits such as Can’t Get By Without You, Can You Feel The Force and You To Me Are Everything continue to tour after 45 years in the music business, despite the sad passing of Eddy Amoo in February this year. Tune in to Mad Wasp Radio on Sunday 1st July, from 7pm, to hear Chris choose his Favourite Five 80’s tracks and share some of his memories of the decade. We also have two pairs of tickets to see The Real Thing on 13th July at The King’s Hall, Herne Bay to give away, so be sure to tune in. Plus, if you want to have a song played on the show, get your requests to me using #My80s on Twitter, via the show’s Facebook page or using the contact form on my website. This week on the My 80s radio show my special guest willbe Jenny Colgan. The best-selling author of titles including The Little Shop of Happy Ever After, The Endless Beach and Looking For Andrew McCarthy (well, she is an Eighties’ girl after all) will be choosing her Favourite Five Eighties’ tracks and recalling some of her memories of the decade. So, if you want to hear Jenny’s fantastic five choices, and also discover who was the heart throb who adorned her teenage bedroom walls, tune in to Mad Wasp Radio from 7pm this Sunday. You can also join in the Twitter conversations that accompany every show by using #My80s to tweet your comments and make requests for future shows. It’s a lot of fun and I look forward to chatting to you on the hashtag – I’m @MyEighties. I have never made any secret of the fact that my all time favourite song of the entire Eighties is The Kane Gang’s “Closest Thing To Heaven”. So, you can imagine how delighted I was when former band member, David Brewis, agreed to appear on this week’s My 80s radio show. Tune in from 9pm this Thursday (14th Sept) to hear the multi-instrumentalist choose his Favourite Five 80’s tracks and talk about his new album Autoleisureland. I will also be playing a track from the album, but if you can’t wait until then you can order your copy from autoleisureland.com. Just a reminder that this week’s My 80s radio show will not be broadcast in its usual slot tonight at 9pm. Instead, it will go out this Saturday (9th September) at 1pm, as part of the Mad Wasp Radio launch weekend. The show will also be repeate d at 8am the following Monday. We return to our usual slot of 9-11pm on Thursday 14th September, with that show then being repeated the following Saturday at 1pm and Monday at 8am. As before, all My 80s shows will be available on Mixcloud after their initial broadcast. Requests for a song to be played on the show or suggestions for the Back On Track (any track from an 80’s album that was not released as a single) and Word Up (song featuring that week’s word in the lyrics or title) features can be made via the show’s Facebook page, via Twitter @MyEighties using #My80s or via the contact form on my website. I look forward to chatting to you on Saturday, when I will be making my Mad Wasp debut, hot on the heels of the Rockabilly ‘N’ Blues Radio Hour. To check out what other fantastic shows Mad Wasp Radio has on offer, take a look at their weekly schedule. Scroll to the bottom of the page for the week’s schedule at a glance.